We had a very long layover between Guam and Bangkok; about 10 hours. So, since Mark and I are Americans and don’t need a visa to roam around the Philippines, we decided to venture out into Manila. 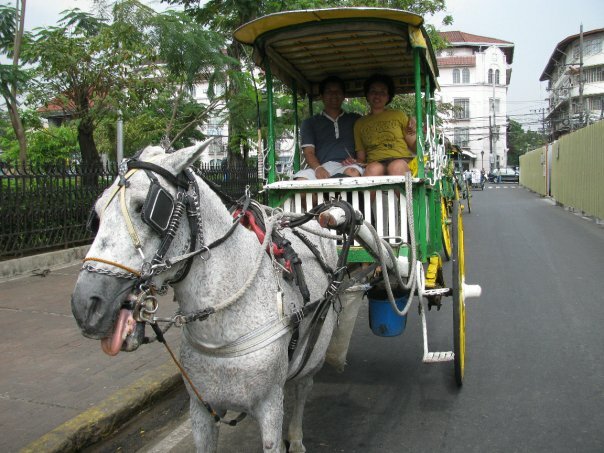 We looked Manila up on wikipedia.org and thought that we could see the most stuff by just going to Intramuros. 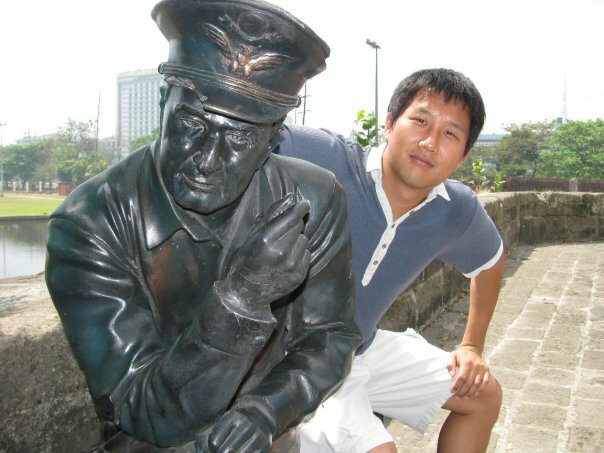 Manila was a nice city. It was very hot and the heat made us feel very tired. Riding around in a horse-drawn carriage was a relief but it was not without its drawbacks. Our horse farted a lot! The next time we go to the Philippines, I hope we get to go to Cebu. Maybe we’ll have time to ride in a jeepney and we can see the dancing prisoners. Here’s a sample to hold you, blog reader, until then. Okay, This is actually Mark being searched at a mall in Manila, but you get the point. 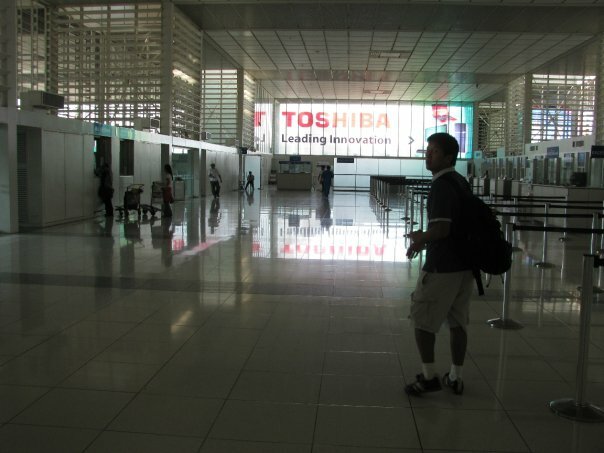 I hated the Manila airport. Rather than rant on about it, I think it is easier for me to put my annoyances in list form and in no particular order. Constant frisking. – Anytime you go from one area to another, you get a pat down. Lack of decent bathrooms. – Prepare to wait in line. Lack of decent restaurants. – There are only 2 food shops. The food is bad and overpriced. They both close around 19:00, one ran out of food before that. Lack of internet. – Free wireless internet only works in one spot; near the Mabuhay Lounge. The free computers available do not actually work. Constant Announcements in 3 languages. – There is no way to sleep with all that noise. No Public transportation access. – You have to take a cab or drive there yourself. Not much to do while you wait for your flight. You can enter by plane or boat. Most citizens from many countries do not need to get a visa before going to The Philippines. To be completely sure, check with the embassy of the Philippines in your country. 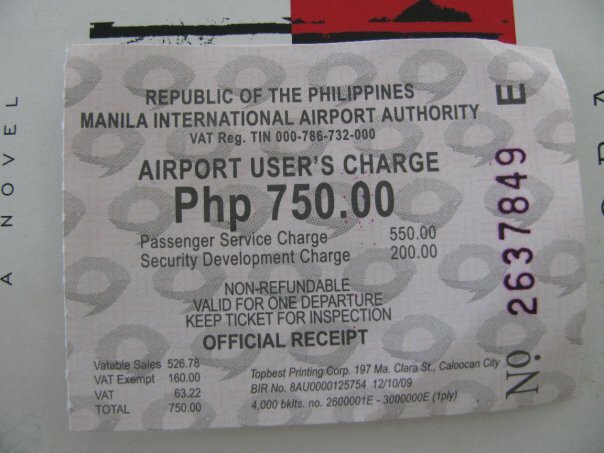 There is an airport fee you must pay to enter the airport in Manila. This only applies to people flying from Manila to somewhere else, not people coming into Manila or non-travelers picking up or dropping off a traveler. 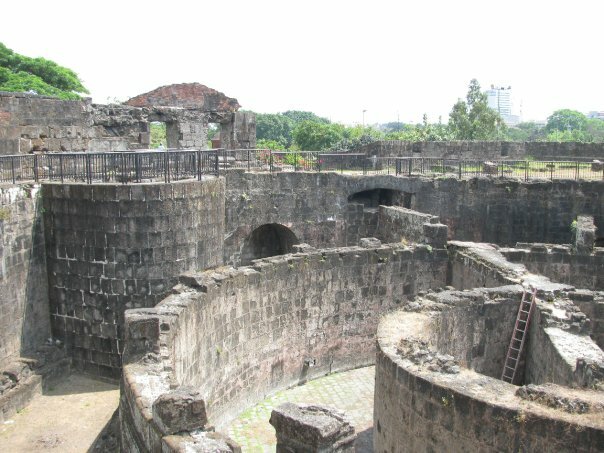 It is in the area of Manila called Intramuros. 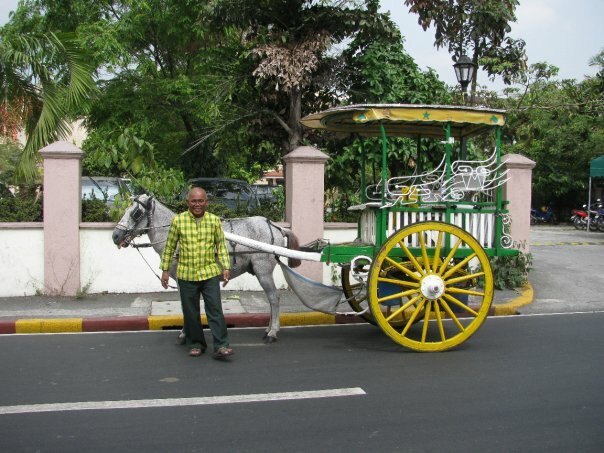 Intramuros is an old walled city build by the Spanish. Actually, built for Miguel López de Legazpi. Remember him? He first stopped off in Guam. 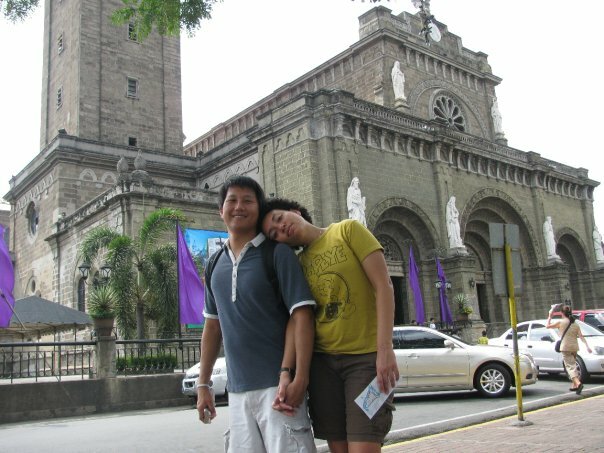 In Fort Santiago there is a small chapel, “Our Lady of Guadalupe“, many picnic areas, a new WWII Bamboo park, prisons, and other stuff. The main attraction is the Rizal Shrine. Dedicated to preserving the memory of the Philippine hero, José Rizal. This shrine holds many of his writings, collections, and quotes. There is a retelling of his last moments alive through statues and eerie metal foot steps that lead to the place where he was executed. He was arrested in Spain for his plans of rebellion against the Spanish government and thrown in jail in Barcelona. He was later sent back to Manila were he would stand trial and be shot. 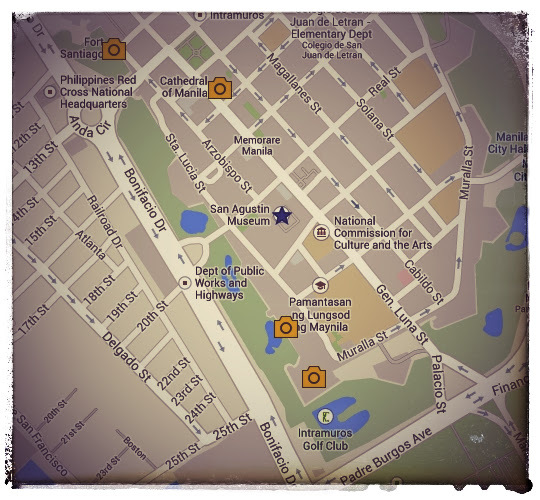 It is within walking distance of Fort Santiago on Postigo (street). 7:30 – 0:30 Tourist are asked to respect church services. This church has been destroyed and rebuilt so many times; I wouldn’t bore you with the history. There is a replica of Michelangelo’s Pieta in the cathedral. Other than the replica, the place is quite forgettable. Right outside the church is where we found a horse and buggy to take us around. The ride cost 250PHP per person per half hour. Head south-south east for two blocks. 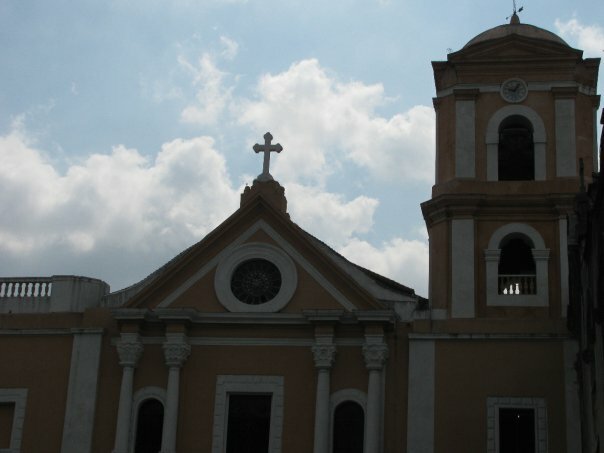 The church is on the corner of Gen. Luna and Real. This place is great. It’s filled with lots of historical information; not just about the church, but about Manila and the Philippines. Unfortunately most of the great stuff are put in rooms where cameras aren’t allowed. If you want to learn about Spanish explores, check this place out! It’s near the corner of Sta. Lucia and Victoria, but towards the western end of Victoria. This place was once the headquarters for Gen. Douglas MacArthur. 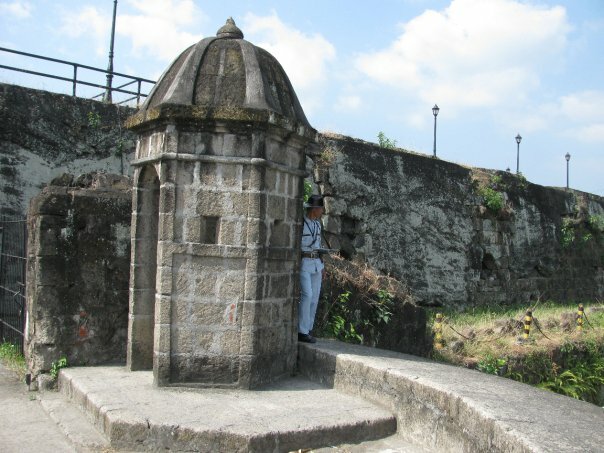 It was destroyed by the Japanese during their invasion of Manila. It’s on the corner of Muralla and Sta. Lucia. This was built by a Jesuit priest name Antonio Sedeño. According to our horse cart driver, it was later used as a place to keep prisoners, then a place where many Japanese soldiers committed harakiri. Now it serves as a wedding garden. Romantic huh? The cab driver will ask you which terminal you want, so figure that out before you flag down a taxi. There is only one airport in Manila and it has 3 terminals. Some cabbies seem to think that there 3 airports named, terminal 1, terminal 2, and terminal 3. Don’t exchange your pesos before paying your 750PHP Airport User’s Charge. You can use pesos or US dollars (16.50USD). Be ready to be constantly frisked. The Manila Airport is one of the worst airports I’ve ever visited. It’s too small, old, and there’s nothing to do. To make things worse, the free wireless internet only works in one spot; near the Mabuhay Lounge. Don’t come here hungry. The “restaurants” here tend to run out of food. It’s mostly microwaved food in the first place. Bring a good book, but don’t expect any quietness. They make announcements every 5 minutes; first in English then in Tagalog, then in some other language. The amount of announcements you hear, you would think you were in a huge airport!